Cepha observed the two galleons turn broadside. As greed and hatred erupted into sea-churning canon fire, she flung a tentacle into the pool beside her, summoning the sisterhood. They came, they writhed, and the sea boiled. They pulled timbers apart with zealous suckers. Masts crashed onto splintering decks. Water gushed in. For the humans must pay: creatures, so new to old Mother Earth, now plundered her riches and fought over them. Cepha stirred the pool again. 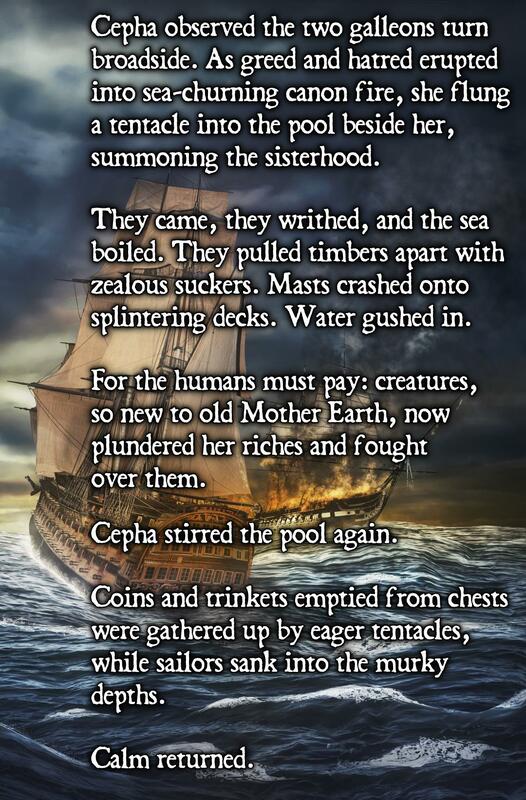 Coins and trinkets emptied from chests were gathered up by eager tentacles, while sailors sank into the murky depths. What a nice surprise I had the other day. I love the way Jason has presented my winning piece – as with all his work. Take a look if you haven’t already discovered his dark and humorous little stories!